The Ribbon of Green Plan provides strategic guidance for the southwest and northeast reaches of the North Saskatchewan River Valley and Ravine System. This video provides an overview of the plan framework, including Vision and Principles, System-wide Policies, Site Direction and Implementation. The Ribbon of Green project focuses on the southwest and northeast corners of the city. This map shows the two study areas together in detail. The North Saskatchewan river valley and ravine system is the Edmonton region’s greatest natural asset and a significant contributor to the quality of life for Edmontonians. Long established as a gathering place for Indigenous Nations and then fur traders, Edmontonians continue to value the conservation and celebration of the natural and cultural heritage of the river valley. Phase 4: "Confirm Our Ribbon"
In this engagement phase you had an opportunity to review and comment on the revised draft Ribbon of Green plan which includes policy direction, programming guidance and proposed trail networks for the southwest and northeast portion of the river valley and ravine system. Thank you to those who participated in this phase - your input will help to refine the draft plan before it goes to Council in 2019. People shared their voice on our Phase 4 online survey. Reviews best practices from around the globe that will inform the Ribbon of Green project. Outlines how the Ribbon of Green project will align with key projects, as well as the relevant acts, policies and plans. In 1990, the Ribbon of Green Concept Plan provided a foundation for the planning, management, and prioritization of park development within the North Saskatchewan river valley and ravine system. In 1992, the Ribbon of Green Master Plan divided the system based on priorities for planning and infrastructure. It presented a decision-making framework based on technical analysis, policy and financial data. 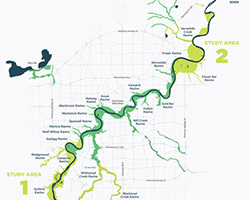 The Ribbon of Green (2018) will consolidate these original Ribbon of Green plans, and develop strategic guidance for the southwest and northeast corners of the river valley and ravine system that was not previously undertaken. This project will also consolidate those study area plans with the Ribbon of Green 1990 and 1992 documents into one easy-to-use Ribbon of Green plan. The Ribbon of Green (2018) project will follow the direction and guidance provided through BREATHE. BREATHE is a transformative strategy to make sure that as the city grows, each neighbourhood will be supported by a network of open space for the next 30 years. The Ribbon of Green will follow the direction established in this document including the three key theme areas: Ecology, Wellness and Celebration. The river valley is a critical ecosystem and this project will highlight and support natural ecological processes by respecting the river environment and the surrounding habitat for animals such as birds, fish and moose as well as plants and trees. Edmontonians treasure the river valley and appreciate opportunities to connect with nature within the city. Each study area offers opportunities for health and well-being as well as places for people to be physically active and recharge mentally. The river valley has tremendous historic and cultural significance that begins with a long history of use by Indigenous communities. Also, throughout the river valley, there are opportunities for people to connect with each other and build a sense of place. When creating conceptual plans for the study areas, significant historical and cultural locations as well as key places for communities to thrive, gather and celebrate will be planned for. Check out the article "City seeks input on future plans for river valley," written by Steven Dyer where he interviewed Ribbon of Green’s project manager Ryan Andres to discuss what has been heard so far from the project’s public engagement efforts. In the article, Ryan explains that overall, the team has heard a strong need from citizens to protect Edmonton’s ecological resources, particularly due to the ecologically sensitive areas within the study areas, and that these areas need to be protected. Check out the interview by Global TV where project manager and planner Ryan Andres explains what the Ribbon of Green project will achieve. Ryan was interviewed during one of our Let’s Talk River Valley & Ravines open houses held in March, 2017. Ensure you don’t miss out on any in-person events.